The entry-level guitar is one of the most popular musical instruments not just in the Philippines but in the world. Unfortunately, local entry-level classical guitars can hardly compete with the quality of the more expensive imported brands. This is expected to change soon as local luthiers, or people who manufacture and repair string instruments, will be able to produce and sell entry-level classical guitars that’s cheaper and comparable to their imported counterparts. It’s all thanks to a group of musicians and engineers. For years, Professor Nathan Neil Manimtim would get frustrated each time a student would ask for recommendations on what entry-level classical guitar to buy. Since he started teaching classical guitar playing at University of the Philippines (UP) College of Music in 2002, he would always advise purchasing an imported guitar brand. “Meron naman tayo pero hindi yun ang kailangan namin based on our needs, the quality of what we want (We have local guitars but that’s not based on our needs or the quality we want),” he explains. Manimtim had to say yes when the opportunity to help local guitar-makers improve the craftsmanship of entry-level classical guitars through standardization and making the instrument more suitable for Filipinos. He recalls being asked by the Dean of the College of Music, Dr. Jose Buenconsejo, for a possible research project on musical instruments. He immediately suggested studying local guitars in the hope of making the local guitar industry more competitive. His research idea gave birth to Gitara ni Juan, a Department of Science and Technology (DOST)-funded research project that would create a compendium on guitar-making in the Philippines. Manimtim, the team’s project leader, coordinated with UP’s Electrical and Electronics Engineering Institute and the Department of Mechanical Engineering under the College of Engineering to put together a group consisting of mechanical and audio engineers, a musicologist and a guitar-maker. 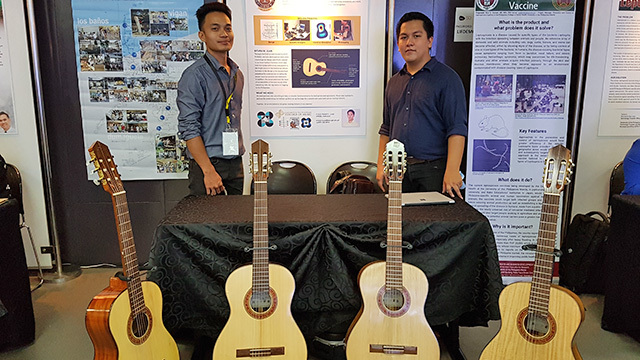 With a Php5-million grant from the DOST’s Philippine Council for Industry, Energy and Emerging Technology Research and Development (PCIERD), the team went to Los Baños, Vigan, Pampanga, Cebu, Dipolog and Dumaguete to study how backyard guitar-makers manufacture the six-stringed instrument. The team discovered that local classical guitars are not at par in terms of playability, sound quality and manufacturing consistency. The kind of wood used in local guitars was a main concern as some backyard luthiers scrimped on the lumber used for the instrument. “Yung ibang kahoy na ginagamit galing sa nagibang bahay, scrap wood, panggatong. Yung iba may mga tama ng pako (Some of the wood used came from torn-down houses, scrap wood, fire wood. Others have nail marks),” Manimtim says. Tonewood, particularly spruce, is one of the most widely used materials for the instrument but is quite expensive. The research group had to find substitutes for the Spruce wood to bring down the cost of local entry-level classic guitars. With the help of the Forest Management Bureau, Gitara ni Juan identified local wood species that are comparable to the traditionally used tonewood. After 18 months of research, the team produced prototypes using several different wood species. The prototypes have already undergone acoustic analysis as well as FEA simulations test or the simulation of vibration, among others. 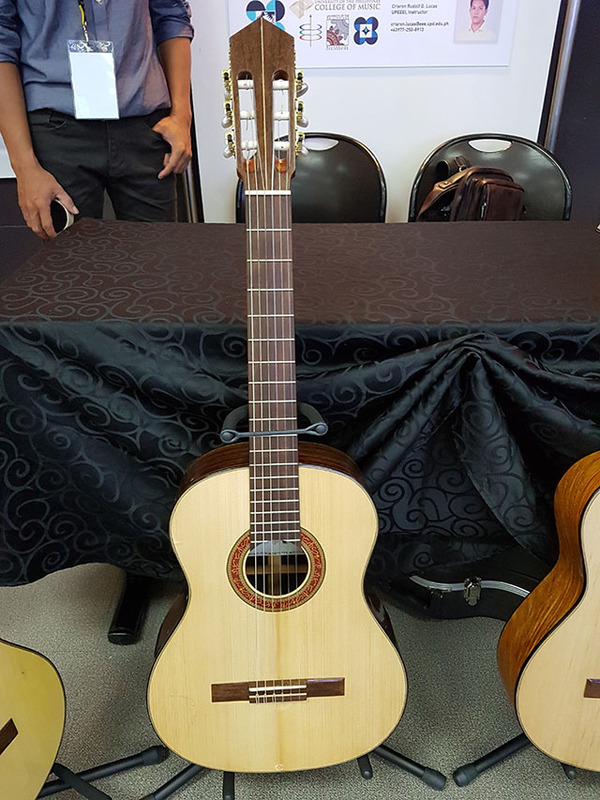 Gitara ni Juan says their prototypes cost at least 40 percent lower than one of the cheapest and popular imported classical entry-level guitar, a Manuel Rodriguez, which sells for about Php25,000. The prospects for local luthiers are bright since there is a market for entry-level classical guitars, the group shares. Based on their research, some 2,400 guitar students in the country purchase classical entry-level guitars annually, 80 percent of whom buy the imported brands. The figures exclude hobbyists who purchase and play guitar without formal lessons. The team hopes to obtain the intellectual property license soon, which is registered to the University. Several local guitar-makers have already signified their interest of getting hold of the manual and start manufacturing guitars that can compete with imported ones, sells for a much lower price and produced for Filipinos. “Ang gusto talaga namin ay makagawa ng compendium, ng reference para ma-improve ang pag gawa nila. Pag bumili ka ng libro on guitar-making abroad ang context niyan is sa controlled temperature and controlled humidity. So, Ang Gitara ni Juan ay contextualized sa sarili nating conditions. (What we really wanted is to draft a compendium or reference so they can improve their production. Books on guitar-making bought abroad are under the context of controlled temperature and humidity. Gitara ni Juan is contextualized for our condition),” Manimtim proudly stresses. Gitara ni Juan was one of the 15 presenters at the Newton Agham Leaders in Innovation Fellowship Demo Day held on August 2, 2018 at the Asian Institute of Management.